Kit is available from 8 different overseas stores or Mega Hobby for $19.51, Kit Linx for $17.44 or Sprue Bros for $18.49. Copyright of the kit is 1996. I paid $16.98 for my kit back then at a local shop that went out of business. 2.8 cm schwere Panzerbüchse 41 (sPzB 41) or "Panzerbüchse 41" was a German anti-tank weapon working on the squeeze bore principle. Officially classified as a heavy anti-tank rifle (German: schwere Panzerbüchse), it would be better described, and is widely referred to, as a light anti-tank gun. Although the sPzB 41 was classified as a heavy anti-tank rifle, its construction was much more typical of an anti-tank gun. Like the latter, it had a recoil mechanism, carriage and shield. The only significant feature the weapon had in common with anti-tank rifles was a lack of elevation and traverse mechanisms—the light barrel could be easily manipulated manually. The design was based on a tapering barrel, with the caliber reducing from 28 mm at the chamber end to only 20 mm at the muzzle. The projectile carried two external flanges; as it proceeded toward the muzzle, the flanges were squeezed down, decreasing the diameter with the result that pressure did not drop off as quickly and the projectile was propelled to a higher velocity. The barrel construction resulted in a very high muzzle velocity - up to 1,400 m/s. The bore was fitted with a muzzle brake. The horizontal sliding breech block was "quarter-automatic": it closed automatically once a shell was loaded. The gun was equipped with an open sight for distances up to 500 m; a telescopic sight, (ZF 1х11 from the 3.7 cm Pak 36 anti-tank gun), could also be fitted. The recoil system consisted of a hydraulic recoil buffer and spring-driven recuperator. The carriage was of the split trail type, with suspension. Wheels with rubber tires could be removed, making the gun significantly lower and therefore easier to conceal; the process took 30–40 seconds. The guns' construction allowed tool-less dismantling to five pieces, the heaviest of which weighed 62 kg. 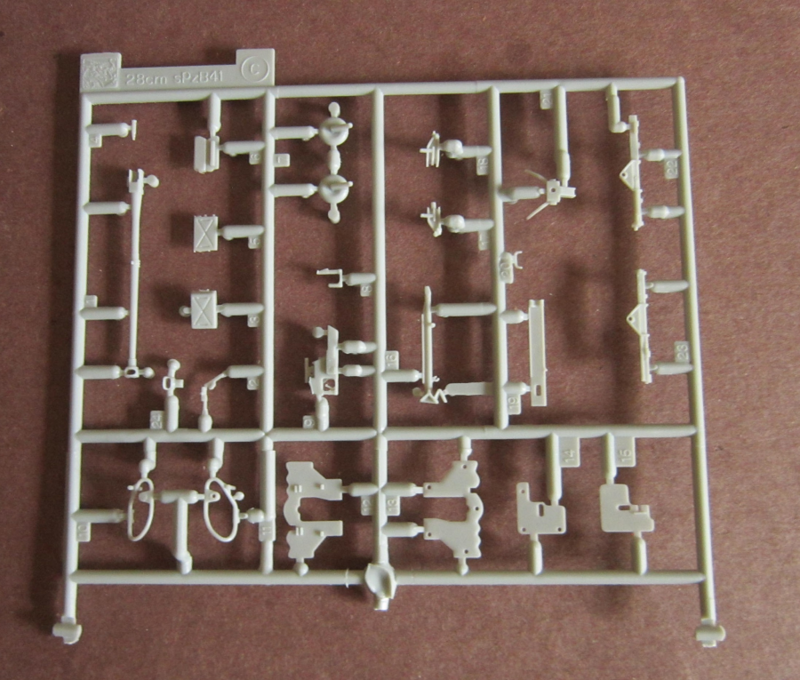 DML Dragon is a prolific model company based in Honk Kong, China. They manufacture all manner of model subjects in the popular scales. The kit came in a shrink-wrapped tray and lid type box. 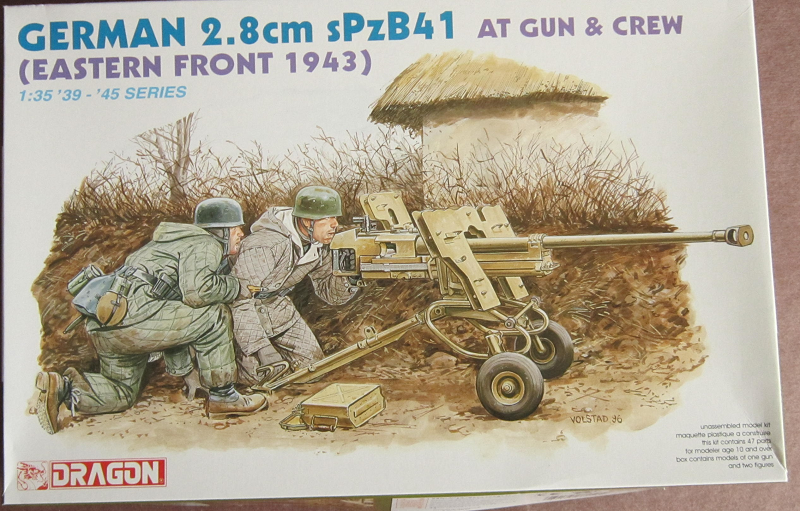 The box art shows the gun set up next to a hedge with a house with as straw-thatched roof behind it. The gun is overall earth yellow. Both of the crewmen manning it are wearing Fallshirmjager (German paratrooper) steel helmets and field gray winter quilted uniforms. One man is kneeling on both knees and aiming the gun. The other man is kneeling on one knee and handling him an ammo round. He has a canteen, mess kit and canvas sack on his belt. 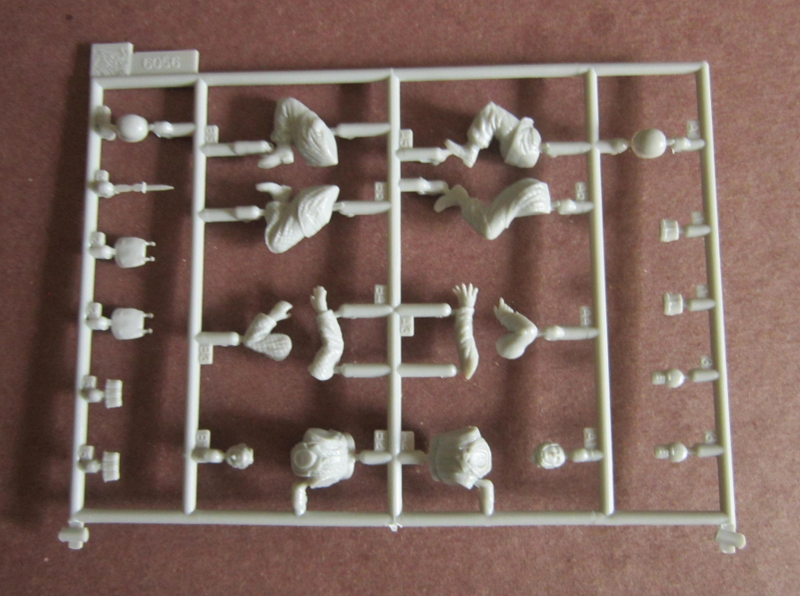 One side panel shows color box arts of two other kits DML manufactures: kit no. 6059, Waffen SS Grenadiers (Karkov 1943) and kit no. 6060, a Hetzer Command Version. These are followed by CAUTIONS about the kit in 6 languages, including English and kit not suitable for children under 3 in multiple languages and Italeri being the European distributor of DML kits. ​The kit is designed for modelers over the age of 10. The other side panel has 3 color walk-around photos of the gun in an unknown museum, followed by the copyright date of 1996, over DML's address in Honk Kong, China and the kit was made there. This kit holds 3 pale-gray parts trees in 3 sealed clear cello bags and the instructions. Page 1 begins with a black and white repeat of the cover art, over the parts trees illustrations. Page 2 begins with CAUTIONS about the kit, over international assembly symbol explanations and a suggested listing of Gunze Sangyo and Italeri brands of paint colors in 6 languages, including English, over the first assembly step. Page 3 through 7 give a grand total of 13 assembly steps. Steps 1 to 9 are for the gun. Steps 10 to 13 are for the crew figures. Page 8 is the marking and painting instructions, over the copyright date of 1996, PRINTED IN HONG KONG and decal application instructions. The decal application instructions are redundant and not necessary, because there are no decals included in the kit. Only the tree holding the gun parts is alphabetized as letter C tree. The tree holding figures is not. Nor is the tree in the kit holding 98K carbines. The carbine kit isn't illustrated in the instructions. ​The third un-alphabetized pale-gray tree holds three 98K carbines. ​There are no decals in the kit. The detail is very good.